Saman Tabasinejad immigrated to Canada from Iran in 1997. She moved with her mother, father and older brother. Since arriving to this country, Saman has always lived just north of Toronto’s downtown core. Thirteen years ago, she and her family moved to Willowdale, a neighbourhood in North York. Today, Saman is running for Toronto City Council, representing the community she calls home. This young woman’s life in Willowdale has exposed her to lessons about community, the importance of social programming, ensuring access to affordable housing and how critical it is for local leaders to listen to the voices of the people around them, regardless of their background or status. 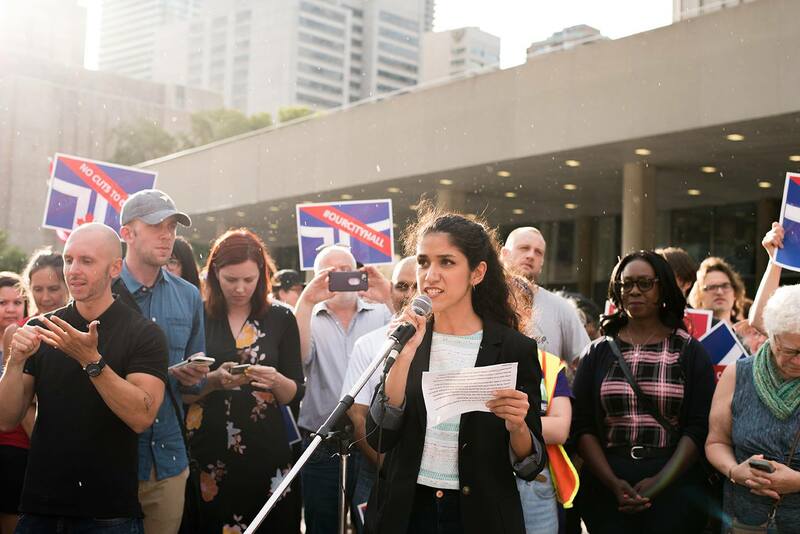 With Toronto’s municipal election set for Oct. 22, 2018, we connect with Saman to learn about why Willowdale, and the rest of the city, need her. What was the move to Toronto like for you? How old were you at the time? I moved to Toronto from Tehran when I was four. I remember not fully grasping the sheer distance between the two countries or what it meant to not understand the languages spoken around me. I remember being in kindergarten and crying because of the language barriers – it’s very disorienting as a child to not understand what is going on around you. I also remember the difficulty of leaving a country where I was surrounded by a large family. In Canada it was just me, my mother, father and my brother. What was one of your earliest observations about Toronto when you first came here? How has the city changed or grown since you first set foot here? The first place we moved was near Don Mills – before the Sheppard [subway] line was built. I remember our first winter – the same way I think all immigrants remember their first Canadian winter! I remember our home was a long walk from the grocery store. We loaded groceries onto a sled because we could not fathom how else to transport goods on the snowy sidewalks. Looking back on it, it’s quite an innovative idea! Sleds make the perfect ad-hoc cart in the winter. And as an added bonus for us kids, we could go sledding before grocery shopping! The city has grown and changed immensely – the Sheppard line was built, which makes grocery shopping much easier! Your family moved throughout many Toronto neighbourhoods before settling in Willowdale in 2005. Why did Willowdale appeal to you and your family? Before we moved to Willowdale in 2005, my family would often visit the neighbourhood’s Iranian shops. Us kids especially liked this because it meant we got to buy our Iranian sweets. I always associated Willowdale and the local Iranian community (that existed then and continues to thrive now) with feelings of home and family. As an added bonus, Willowdale has three subway stations so the neighbourhood’s easy access to transit was very appealing. What is one of your favourite parts about living in Willowdale? Willowdale is a truly unique neighbourhood – from the dynamic local business scene, to the different types of landscapes, to the diverse residents. Around 60 to 70 per cent of the community is racialized and folks come from all backgrounds. Willowdale truly serves as an amazing model for what Toronto can look like if we continue to embrace the diversity and work to build bridges between its different and vibrant communities. How do you hope the community will improve in the months ahead? What are you doing to reinforce the importance of these changes? I think Willowdale, and all of Toronto actually, is at an impasse. We are struggling to create a shared vision for our community and our city. I hope that in the months ahead, we are able to answer important questions such as, what kind of transit should we be investing in? What kind of public spaces should we be building? What sort of public services should we be developing? I hope that we are able to find answers that resonate with everyone and benefit all communities. Specifically in Willowdale, our population is growing and unfortunately, it does not seem like our resources are expanding at the same rate. We have kids in our neighbourhoods (especially those residing in [apartment] buildings) who are unable go to school in their own areas because of the lack of planning. City councillors can put pressure on our provincial government to ensure that Educational Development Charges (EDCs) are enforced and effectively used to expand schools. EDCs are a one time fee that developers would pay for each unit and we use that to fund school expansion. When I knock on doors, residents often do not know exactly why their four-year-old cannot go to the school they can see from their balcony. They often do not know where to place the responsibility. It is the job of the city councillor to work with all levels of government to make sure these necessary projects get done and address problems that Willowdalers face everyday. You’ve worked to ensure refugees in Toronto have access to affordable housing through a program called Roofs for Refugees. How long have you been working with Roofs for Refugees? What is the most challenging part of your role with the organization? I became involved with Roofs for Refugees in 2015. The most challenging part of many non-profit and NGO organizations is navigating the restrictive policies and lack of funding. Affordable housing is very hard to come by – especially in a city like Toronto. We are constantly running into problems as the available affordable housing is often in resource deserts. We need policy change to make affordable housing a reality by investing in quality housing, controlling the rampant rent increases and making sure that we do not have pockets of the city that lack grocery stores, social services and transit. You’re also on the Board of Directors of the Iranian-Canadian Congress. May you describe the type of work that you do with the congress? How has it impacted you? I am the Chair of the Policy Department and we work on research and policy suggestions for different levels of government. For instance, we worked on a policy report for the provincial government about Foreign Trained Professionals (FTP). This report outlined the different barriers that prevent FTPs from working in their fields, discriminatory practices that newly-arrived immigrants face and practices and policies the government can adopt. I really enjoy working with the ICC. I’m very passionate about issues that affect Iranian-Canadians and feel privileged to be working with and for my community. Now, you’re running for the position of City Councillor in Ward 28 this fall in Toronto, hoping to do more to improve affordable living within Willowdale, while continuing to keep residents safe, improve transit, provide equal opportunity for education and support small businesses in the area. Is this the first time you’ve entered a political race? What has the campaign experience been like, so far? This is my second political campaign – I ran in the 2018 provincial election. After the election, I was urged by Willowdalers and other supporters to run municipally. Many residents approached me and told me they never thought there would be a progressive voice in Willowdale – but my campaign changed that. My team and I are proud to continue the fight to bring progressive voices to Willowdale. This election has been a whirlwind! We have been getting more support everyday – which has been amazing – especially as the ward changes have left people a bit confused. It seems like more and more Willowdalers are excited at the prospect of having a progressive voice representing the community. Why is having the opportunity to run for a position on City Council so significant for you? Willowdale is my home. I live here and I grew up here. I want to make sure our councillor is working for all of us. We have an opportunity to make sure that the resources are well distributed, to ensure that our public transportation accounts for the commutes of all Willowdalers, that our small businesses are well supported and to create a welcoming culture in our neighbourhood. We have such a dynamic community, but we need to have a vision to meld the more suburban parts of our neighbourhood with the more urban parts, while ensuring no one gets left behind. I believe we need someone who has the patience and care to navigate the many different communities. We need someone to build bridges between the many different expectations individuals have for Willowdale. We need bold ideas for problems like childcare and education. We need to be taking our neighbours’ concerns seriously and arrive at practical solutions. My professional and academic background have prepared me to be able to think of creative solutions. I am committed to making Willowdale a community that works for everyone. Doug Ford, the Premier of Ontario, hopes to slash the number of City Councillors in Toronto by 50 per cent, even though we’re in the middle of an election campaign. How do you feel about this decision? How will reducing the number of councilors in Toronto influence everyday happenings in the city? It makes my decision to run both easier and harder. It reminds me that we need progressives in Toronto to be strong and bold in the face of those who try to limit our democratic freedoms. It also makes it harder because it creates a much bigger ward with different demands. Willowdale will have half the representation it would have had in the 47 ward system – that directly affects our ability to have our voices heard and our interests served. It also makes it more challenging for the future councillor to be able to meet and address the needs of everyday life. In late July, you spoke at the #OurCityHall Rally at Nathan Phillips Square. How has participating in this rally influenced you? How do you hope it’s impacted those around you? Ford’s plan to reduce the number of city councillors will mean that ordinary Torontonians will not have the representation in local government that they deserve. We often forget how fragile our democracy really is and how easily it can be taken away. The #OurCityHall Rally was about raising our voices and pushing back against Ford’s decision. How quickly that rally came about was really a testament to the dedicated Torontonians who know that this city and our communities are worth fighting for. I hope it encourages folks to do something – because we can be angry, but we must convert that anger into productive energy. You’ve talked a lot about the use of a “compassionate voice.” What does this phrase mean to you and why is it so critical in your election campaign? Being compassionate is the ability to patiently listen and seriously consider another position without assumption. It is about going beyond just feeling empathetic and thinking about the larger picture. It is about understanding the root causes of problems and collaborating on solutions. Too often, we are left with empathetic words in responses to small and large issues. Representatives should be using their voice to spur action that lead to permanent solutions. As I mentioned, children in our community cannot attend the schools in their neighbourhood. It’s one thing to speak about the frustration of parents who have to travel far to send their kids to school and it’s another thing to collaborate and work with different stakeholders to ensure we solve the problem. Being compassionate is also recognizing that although I do not experience a problem, that I still have the responsibility to help and work to ensure solutions. I am tired of voices that shirk responsibility instead of thinking about how we are sharing these spaces and resources, and we need to ensure that everyone feels at home here in Willowdale and Toronto. You’re a champion of encouraging people to use their voice to empower others. What advice would you give other Torontonians hoping to make change in this city and across the province? I would encourage others to seriously think about what makes you care about the world and look up organizations that are working on those issues. I also encourage people to either run or support those who are running for office! Electoral politics are so important – it often feels like a slow process, but we need to play the long game if we want our politics and our representatives to be progressive. With so much on the go and with involvement in multiple important projects, who or what do you turn to when in need of motivation, support and an inspirational boost? I turn to my family often – I am blessed to have parents and a brother who are extremely supportive. I am also lucky to have so many wonderful and supportive friends. I also have the best team who are driven by a desire to see a more equitable Willowdale and Toronto. I am inspired by many changemakers and elected representatives. One woman that comes to mind is MP Jenny Kwan – I am inspired by the work she does and the support she gives to many different communities. She’s a great example of what a compassionate leader looks like – not only does she listen to injustices, but she acts and provides solutions for those injustices. She has been in politics for decades and still works tirelessly to ensure that good things get done – regardless of who has formed government. If our readers are interested in supporting your campaign or if they have questions of their own to ask, what’s the best way for them to connect with you? Sending an email is always a good way of connecting with me! You can contact me at, saman@tabasinejad.ca. I also hold weekly coffee meet ups every Sunday from 4:00 to 6:00 p.m. at the Second Cup at Empress Walk (5095 Yonge St.). We’re building something exciting up here in Willowdale, so please reach out if you are interested in volunteering. We are a team of compassionate individuals who want this city to work for everyone. Thank you for sharing your story with us, Saman. We wish you the best of luck at the end of the month and look forward to learning more about your work within the Willowdale community. The feature photo is by Jessica Laforet.